In this age of video games and collectable card games, it's refreshing to see a traditional board game aimed at the RPG audience. 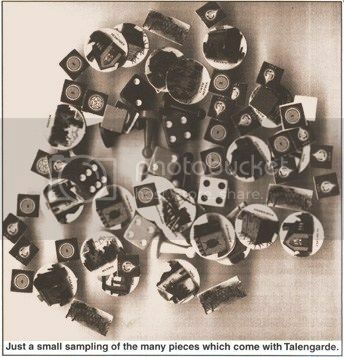 Talengarde takes the elements of a good fantasy RPG and brings them directly onto the tabletop. You start by selecting a hero... This can be a random selection or a purposeful one. From here you get equipment, gold, and life tokens. You can even get an avatar if you've chosen a pious character. Now you place your marker on the edge of the game board nearest you and you're ready to begin. If you've just picked up the game, I suggest you thoroughly read through the handbook before inviting your buddies over to play. There are a lot of rules to read over and have in your head before you should try to run this game. I first played with Neil Melville, who designed the game, and saw first hand how easy the game can be once the rules are in somebody's head. If that somebody is you, you should start reading. The object of Talengarde is to get yourself to a temple. Once there you will be told your quest. Interaction between players is encouraged, and yes, even role-playing is asked for. Now that you've got your quest, you need to be the first player to complete it and return to the temple. You have to consult an oracle to get a little help on your quest. The oracle can either give you several tasks to complete before allowing you to continue your quest, or can point you to the exact location and tell you exactly which opponent will be waiting for you when you get there. The game is nicely built. I enjoyed the randomness of the game, how the world can be set up anyway you want it to be, and can be set up in a matter of minutes. I liked that I could play the same character from game to game, and have a different quest every time. I enjoyed the casual need for role playing between your adventurer and the opponents and other NPCs he/she would encounter. And I didn't need a GM to run it. Although I would suggest the person most familiar with the rules should keep track of the cards. That way you have one person to pull the opponents and assign them their equipment, gold, and life tokens. I did have some trepidation about the size of the game. All of the cards you have to sift through and all of the pieces you have to keep track of can be intimidating. But once you start playing the game, everything seems to fall into place. There's even a handy tabletop piece to organize your cards for easy reference. I was reminded of Dungeons and Dragons(tm) as I played. I started out as a knight. I was pious, so I had an avatar to rely on for some rolls. By the 3rd round I had a thief companion and by the 5th round, I knew my quest. All of the equipment I gathered, I gathered off of opponents who attacked me. I had to face scary monsters in catacombs. And I had to keep track of everything that I owned. I wasn't able to complete my quest, unfortunately. The monster I ran into at the end was just too difficult for my character at the time. But I feel that if we had been able to play a multi-task game, he would have been ready for anything. I would recommend Talengarde to any fan of fantasy RPGs. This game has it all in an easy to set up environment. Your players can even maintain the same character from game to game, building up their skills and equipment as they complete one quest after another. In games that long you could even replace your game marker with a lead figure. If you've never played an RPG before, here's a chance for you to see what it's all about while still playing in the familiar safety of a board game. Talengarde is truly only limited to your imagination.